CRCT week is here! You should be very excited for yet another chance to "show what you know"! The best thing you can do now to prepare is to take a deep breath and have confidence in yourself! Since testing will take up most of our time together this week, we will not have any homework or classwork to complete. We will do a really fun art activity together that focuses on using ratio and proportions to create scale drawings. I really think you will enjoy it! Relay For Life STUDENT out-of-uniform day Friday May 4th 2012.
from 7 pm to 7 am at Benedictine Military School. Donations will be collected by classroom teachers on Friday morning. Cash or checks welcome. Checks should be made out to the American Cancer Society. Thank you for your support. Check out THIS great probability game! Can you beat the robot race challenge? Welcome back! I hope you had a great spring break, and are rested up to start an exciting part of the school year. Over the next few weeks, we will be reviewing all we've talked about this year in math and science. I've created daily small group lessons, based on need. These lessons will take place during your work time, so it's very important that you are using your class time carefully to complete your required assignments. You may have more homework that you are used to over the next couple of weeks. Remember, the more you put into your studies, the more you will get from it. In math, we will be investigating probably. Using games of chance, we will discover fairness, odds of certain outcomes, and the difference between experimental/theoretical probability. Check out this game to help you practice finding probability. Don't forget to click "Help" at the top of the screen if you have trouble with the game. We will have three homework assignments this week, and a quiz on probability Thursday. Please remember to stay up-to-date with your geometry sky tower assignments. Also, you should be working on www.tenmarks.com as much as possible over the next few weeks. Natural Resource- any natural material that is used by humans, such as water, petroleum, minerals, forests, and animals. Nonrenewable resource- a resource that forms at a rate that is much slower than the rate at which it is consumed. Renewable resource- a natural resource that can be replaced at the same rate at it is consumed. Coal- a fossil fuel that forms underground from partially decomposed plant material. Fossil fuel- a nonrenewable energy resource formed from the remains of organisms that lived long ago. Natural gas- a mixture of gaseous hydrocarbons located under the surface of the Earth, often near petroleum deposits; used as a fuel. Petroleum- a liquid mixture of complex hydrocarbon compounds; used widely as a fuel source. Biomass- plant material, manure, or any other organic matter that is used as an energy source. Geothermal energy- the energy produced by heat within the Earth. Hydroelectric energy- electrical energy produced by the flow of water. I am ready to get the week started. I hope you are, too! I hope you and your family enjoy a wonderful, and well-deserved, spring break! See you Monday, April 16th! 1. Your Solar System Essay is due. Please be sure that you staple everything to the rubric cover sheet. 2. Your weekly geometry sky tower activity is due. Please remember to keep up to date with your sky tower assignments so you are not behind at the end of the term. 3. If you are participating in the "Kiss a Pig" walk, it will take place tomorrow at 10:30. 4. It is an out-of-uniform day! To dress down, please bring in $1 that will go towards our peer remediation program. 5. There will be no school Friday, April 6. School will commence on Monday, April 16. 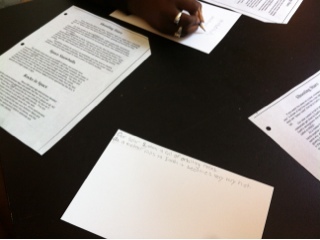 Students wrote "Found Poems" about comets, meteors, and asteroids today in class.